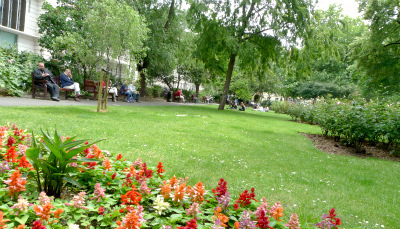 Located right beside the world renowned Great Ormond Street children's hospital in central London, Queen Square Gardens is a tranquil and pretty spot that never seems to get particularly busy. This is probably because it's away from the busy thoroughfares, so never gets too much tourist traffic passing close by. 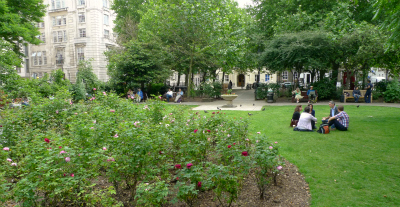 The square was laid out in the early 1700s and today is surrounded by many buildings related to the fields of medical research and health care, such as the aforementioned Great Ormond Street hospital. The Institute of Neurology, which is part of University College London, is also located here. Inside Queen Square are lawns on which visitors are free to relax, as well as lots of benches for those who'd rather not get a damp bottom. You'll find a number of sculptures in Queen Square, including one by Patricia Finch that was commissioned by Friends of the Children of Great Ormond Street nad put in place in 2001. 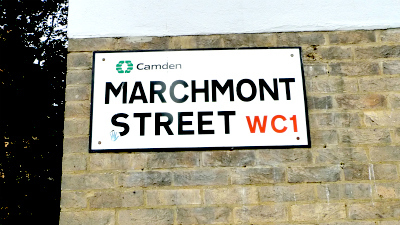 - Marchmont Street is a small shopping street a short distance away, with an interesting mix of shops, cafes, pubs and restaurants. the Brunswick Centre, located right beside Marchmont Street, was recently renovated and is a nice spot for shopping or al fresco dining. - Renoir Cinema, in the Brunswick Centre, screens independent and art-house movies. 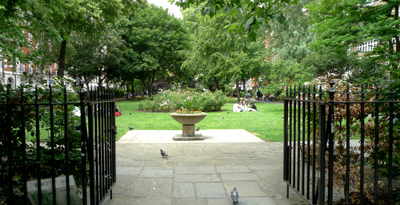 - Russell Square Gardens are bigger and a little busier than Queen Square Gardens, but definitely worth a look. the British Museum is one of London's biggest and best museums and really should be visited if you're ever in this part of town - just make sure you have plenty of time on your hands because it's massive. Why? When you're rushing around London, it's always good to take a break.